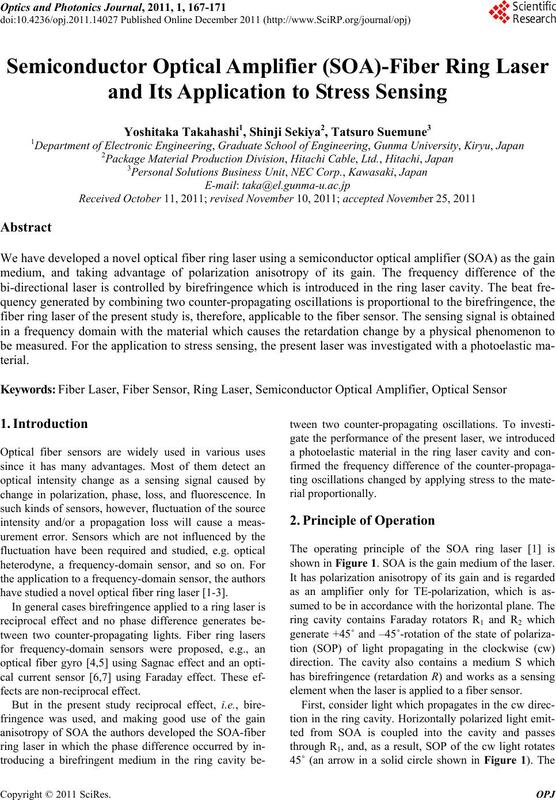 have studied a novel optical fiber ring laser [1-3]. shown in Figure 1. 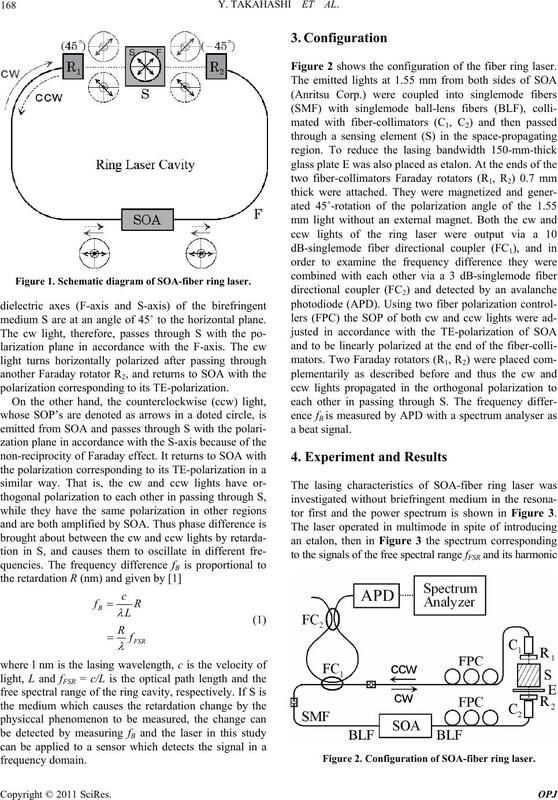 SOA is the gain medium of the laser. element when the laser is applied to a fiber sensor. Figure 1. Schematic diagram of SOA-fiber ring laser. medium S are at an angle of 45˚ to the horizontal plane. polarization corresponding to its TE-polarization. Figure 2 shows the configuration of the fiber ring laser. tor first and the power spectrum is shown in Figure 3. Figure 2. Configuration of SOA-fiber ring laser. MHz, which corresponds to the one shown in Figure 3.
gence in a frequency domain. dation. 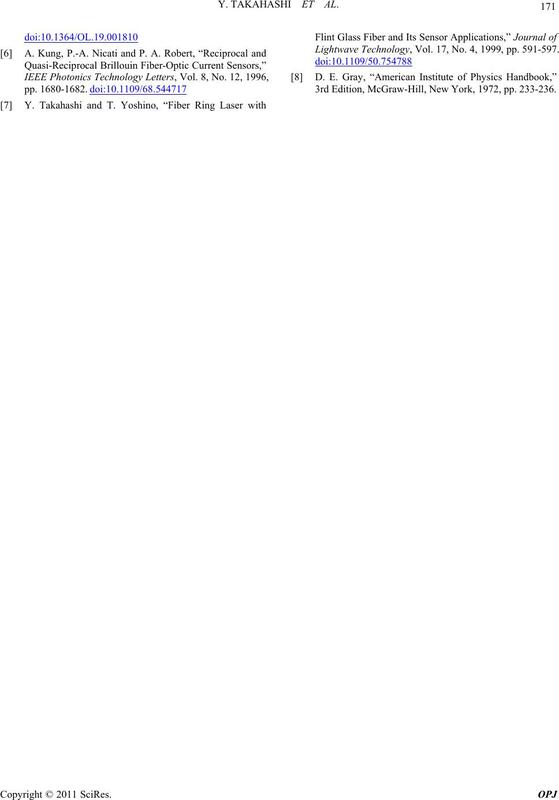 Inset power spectrum is the case of R = 387.5 nm. a fused silica substrate was used as photoelastic crystal. space-propagating region as well as a quarter-wave plate. sor in a frequen c y domain. the lower traces show without and with PET film. sensing element and instability of the laser oscillation. which causes errors of the measured pressure. error was calculated and the result is plotted in Figure 7.
seem to affect the oscillation significantly. physical quantity in a frequency domain. 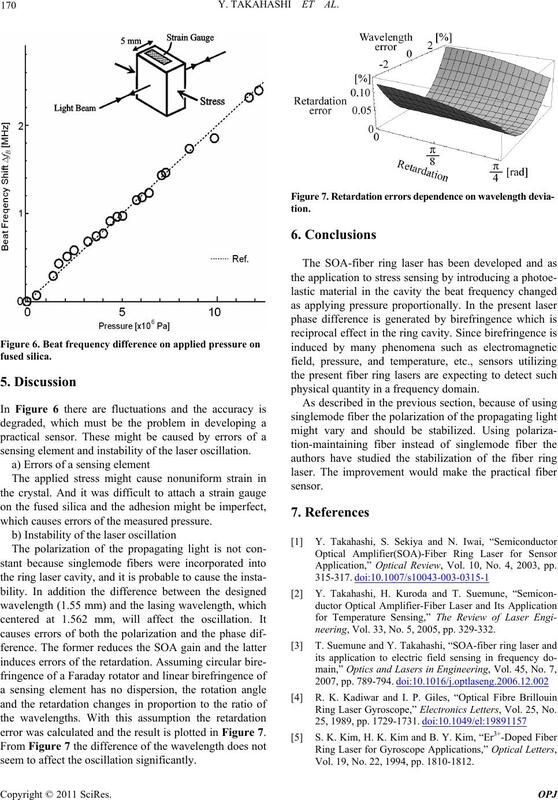 Application,” Optical Review, Vol. 10, No. 4, 2003, pp. neering, Vol. 33, No. 5, 2005, pp. 329-332. 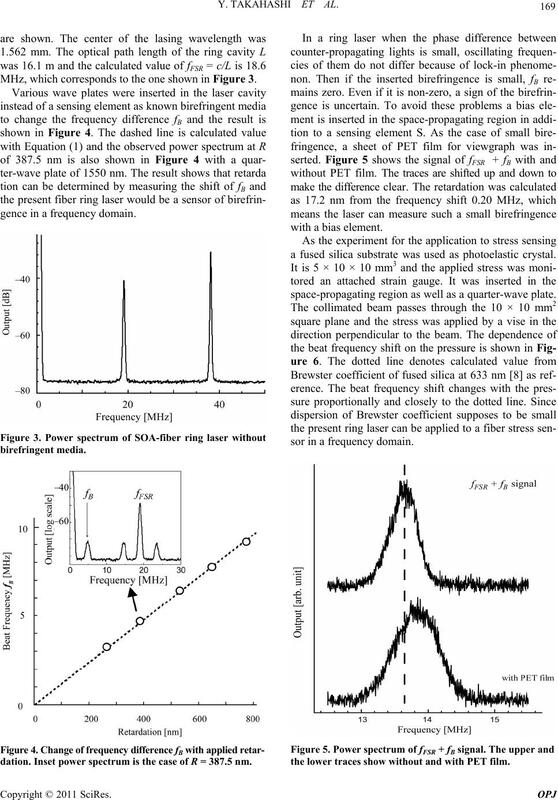 Ring Laser Gyroscope,” Electronics Letters, Vol. 25, No. Vol. 19, No. 22, 1994, pp. 1810-1812. Lightwave Technology, Vol. 17, No. 4, 1999, pp. 591-597. 3rd Edition, McGraw-Hill, New York, 1972, pp. 233-236.